*The general registration fee entitles you to attend all AAIDD Annual Meeting sessions and events held on Tuesday, 6/27 and Wednesday, 6/28. ** Pre and Post conference sessions are 3 hours sessions held on Monday, 6/26 and Thursday, 6/29 and are optional. AAIDD Corporate Members- If your organization is a Corporate member, you’ll get 20% discount on registration fees for employees at AAIDD annual meetings. AAIDD is pleased to host the national meeting of our partner organization on June 24-25, 2017 in Hartford. You’ll be able to register for this meeting through the AAIDD registration link as well. Through the Developmental Disabilities Assistance and Bill of Rights Act of 2000, created the State Councils on Developmental Disabilities which serves to coordinate and provide services for individuals with developmental disabilities. In the United States, there are 56 councils focusing on advocacy, systems change, and capacity building. 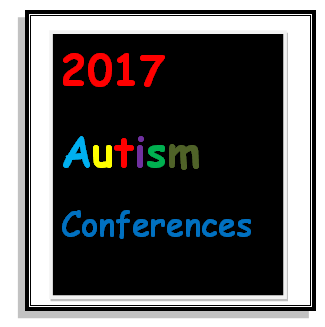 It that time again for the yearly upcoming autism conference listings. The conferences listed are specifically on the topic of autism spectrum disorder. The conferences vary from 1-day seminars to 3-day sessions and keynote speakers. Some of the conferences focus on parents and people with autism, while others are geared specifically for researchers and educators. When you click on the highlighted links, you will find additional information on the costs, location, hotels and detailed information on each conference.. Features Renown Dr. Temple Grandin who will give insights backed by research evidence and her own experience. Featured sessions on post-secondary initiatives, differentiating instruction in the inclusive classroom, sexuality education and managing challenging behaviors. Conference offers a broad review of advances in ASD research, genetics, diagnostic tools and treatments. This conference will focus on behavioral assessment and intervention across the life span of autism. A 3-day conference for educators, parents, caregivers, mental health professionals, service providers and people on the spectrum. A conference on autism for behavior analysis, educators, psychologists, speech language pathologists and parents. The conference theme is, ‘Innovation to Action: Connecting the Pieces with Practical Strategies.’ This conference is intended for professionals, parents and self-advocates. An annual scientific meeting, convened each spring, to exchange and disseminate new scientific progress among ASD scientists. Will include session, keynote addresses and social events for individuals, families, educators, caregivers and service providers on concrete strategies that allow people to interact with one another and the world on their terms. Conference open to anyone interested in learning more about autism, Asperger’s and related disorders including parents/families, caregivers, adults with ASD, employers, educators, professionals, agencies, and self-advocated. Abilities Expo will be coming to Boston, MA, from September 16th thru the 18th. The mission of the expo is to bring necessary products and services together under one roof for the community of people with disabilities, caregivers and healthcare professionals. Workshops include, Living with Chronic Pain, Wheelchair Accessible Travel, Emergency Preparedness for People with Disabilities plus more. Events include, Acupressure for Stress Release, Adaptive Gaming Pavilion and an Assistive Technology Showcase. Registration is free and will be held at the Boston Convention and Exhibition Center, Hall C.
The Conference will be held between October 5 and October 7, 2016. Entitled, “Reducing Disparities for People with Disabilities Through System Change”, the conference will include sessions on inclusion, peer mentoring and smoking cessation for people with developmental disabilities. A one day pre-summit workshop for lawyers will be held on Thursday, October 6, 2016 which is led by the Autism Speaks Legal Resource Center. On October 7th, there will be a joint programming with sessions on autism from both Autism Speaks and the Southwest Conference. The session begins at 8:30am. Conference will feature topics developed specifically for practitioners, scientists and parents of children with autism. The conference will integrate research and practice, reflecting the need for evidence-based and practice interventions within the field. The conference will feature more than 150 lectures and poster presentations. Features Renown Dr. Temple Grandin who will insights backed by research evidence and own experience. Conference will feature autism training and resources for law enforcement, emergency responders, parents, educators, caregivers and the autism community. Dr. Temple Grandin will be a featured speaker. A multi-track, session oriented, academic and professional meeting. Focus will be on transition to adulthood, early childhood, communication, social and behavioral topics. for families, school staff, agencies, community organizations and people with autism. Location: 120 South Wood Avenue S.
Theme: Explore. Connect. Learn. Inspire. Focus is on practical strategies and information that will allow professionals, paraprofessionals and decision-makers to better support they people they serve. Annual scientific meeting convened each spring to exchange and disseminate new scientific progress. The goal is to provide parents, educators, and campus leadership with strategies, resources, tools and evidence-based practices. Dedicated to sharing advances in practical and scientific knowledge about autism to as wide an audience as possible including researchers, professionals, parents and self-advocates.